I moved to San Francisco exactly three weeks ago (a move that I will post about later!) and with the move came: TEMPORARY funemployment, closer proximity to Berkeley Bowl, and friends eager to learn about making jam (among many things). 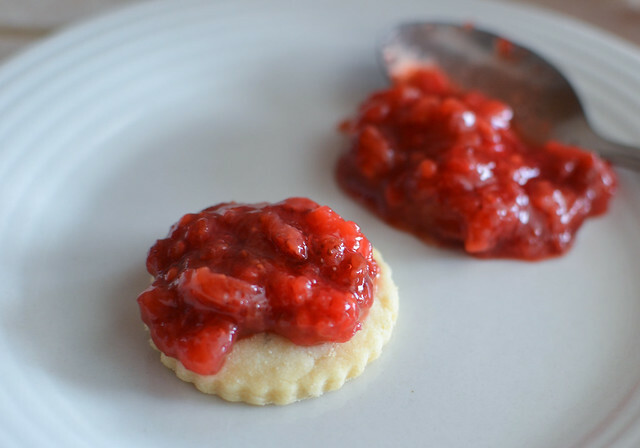 The combination of these three random things somehow resulted in homemade strawberry guava jam! It began when a friend and I went to Berkeley Bowl to where we let the produce inspire us. 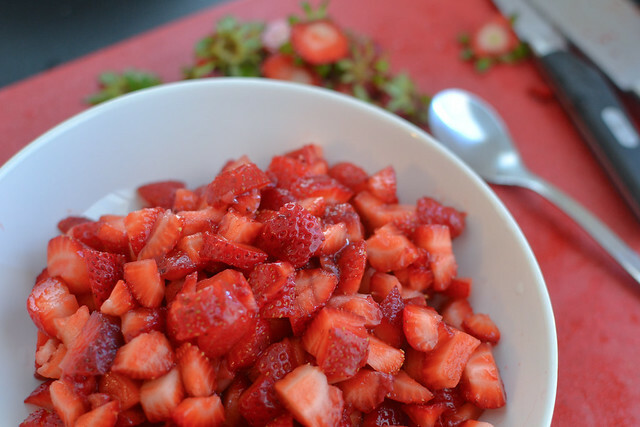 With strawberry season at its peak, we could not pass up the gorgeous bright red, cheap organic strawberries. But every jam needs pectin and strawberry doesn’t contain much so we looked for a tropical fruit that contained more pectin and chose guava. Thus our jam making journey began! I weighed the ingredients I used because I prefer measuring with weight. Feel free to be loose about every measurement! Your jam taste buds may be very different from mine. 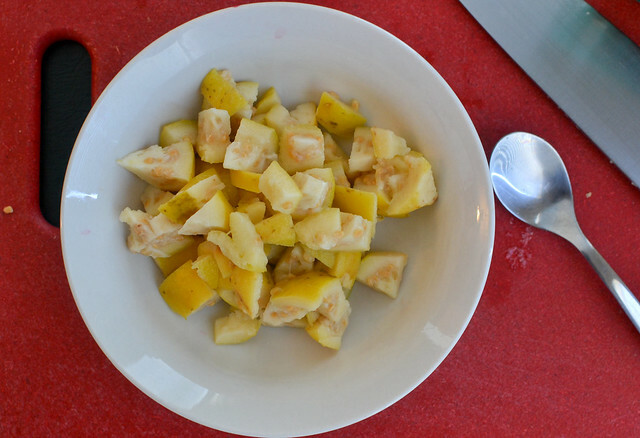 Remove some of the seeds from the guava. I like to keep a little bit of the seeds because the fleshy part of the guava where the seeds are attached is sweet and pulpy. It’s also fun to bite into seeds sometimes. 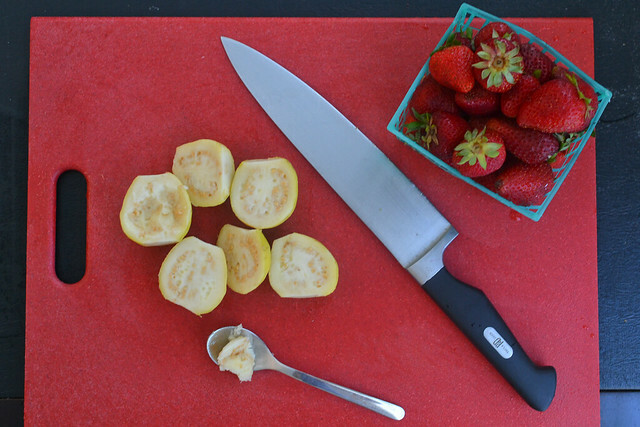 Slice your fruit into small cubes. They don’t have to be exactly the same size but as uniform as possible. While letting the guava boil, fill another pot with the strawberries. Simmer it covered for about 30 minutes or as long as it takes for the strawberries to release its juices. 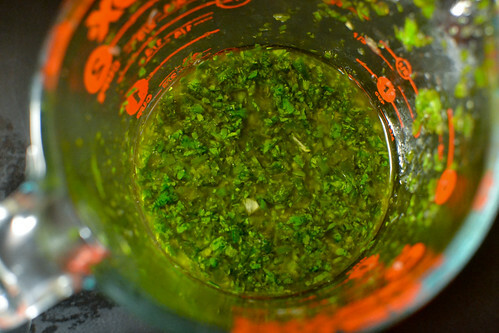 You can add the lemon juice now if you want or omit it altogether. 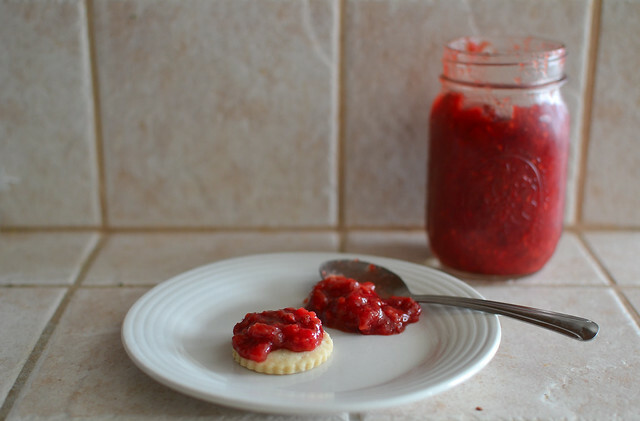 Once the jam is done, put the hot jam in the sterilized jar***. I let it cool for a bit before refrigerating and enjoyed it once it was cool. ***NOTE about canning: I am no expert on proper canning technique. BUT I did sterilize my jar by placing all of its pieces in a large pot of water, boiled it for 30 minutes and took it out with tongs right as my jam was ready to go in. Use a hot jar for hot jam! One fine day in Culver City, I was mad craving some tacos and didn’t feel like trekking to the (real) LA area for some legitimate, authentic ones. Like the avid Yelper that I am, I looked up tacos in Culver City and it led me to Tacomiendo. Culver City actually has a pretty large Hispanic population, so the area that Tacomiendo is located is filled with hidden gems like a Mexican bakery and some family-style Mexican restaurants. I usually find myself at Tacomiendo for a mid-day snack or late night taco craving and I love going there alone because it’s busy yet peaceful and there’s something comforting about eating a taco or two in solitude in the corner of a homey joint with strangers surrounding you. Okay I may not have sold that very well…but it’s just my thing. 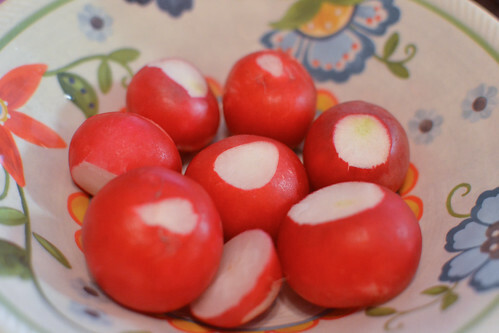 Fresh radishes from Sprouts. They’re so beautiful! The leafy ends are usually trimmed off at the salsa bar at Tacomiendo but I find that they are so adorable with those leaves attached. cilantro lime chicken! 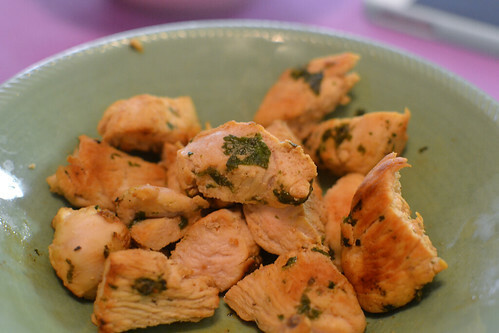 To make the chicken, I marinated it with some lime juice and cilantro and right before pan-frying them (grilling would make them much tastier! ), I sprinkled some salt and pepper. I was incredibly surprised at how flavorful they were despite the ten-minute marinating time and simple ingredients. I believe grilling them would’ve added a smoky flavor! 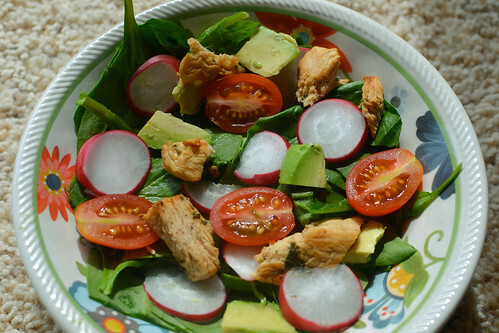 I topped the salad with a cilantro-lime dressing recipe, which I found to have been a little too heavy on the honey. I’m trying to perfect my own recipe that will most likely be more citrusy and less sweet. Again, I’m always for more sour and spicier flavors! And as for the pickling, so far I’ve pickled red onions and jalapenos and I’ve decided that my pickling adventures warrant a whole post, so more on that later! 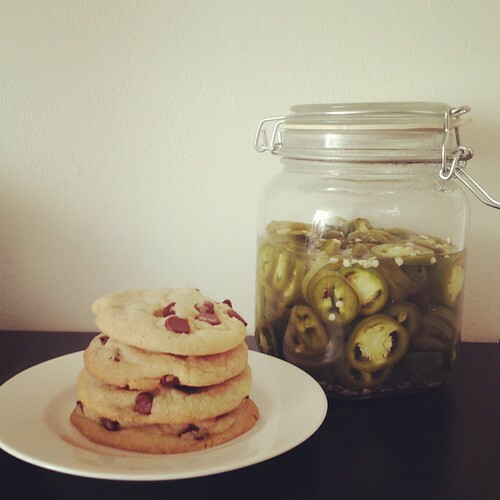 My Wednesday morning was spent in the kitchen, browning butter, baking cookies, boiling vinegar and pickling jalapenos! The progression of smells in the kitchen was definitely…interesting. 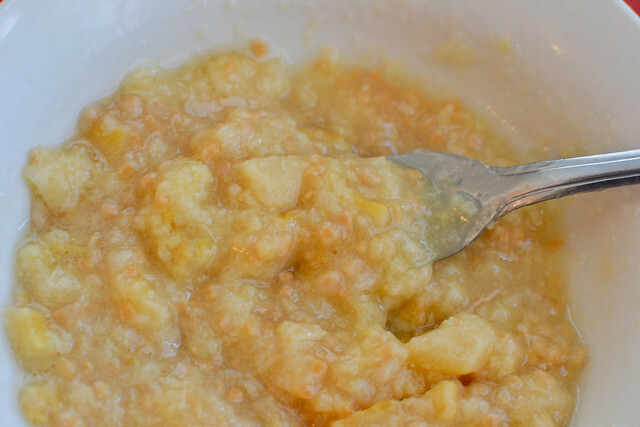 Brown butter is probably one of my all-time favorite smells and vinegar is just…not. I just felt like I needed to bake cookies to re-establish the baking/cooking equilibrium in my kitchen! Plus, the hunt for the best chocolate chip cookie recipe is never ending (at least for now). And now I’m off to my kitchen to bake a coffee cake for church tomorrow! Adios amigos!